The goals accepted by the global community under the landmark Paris Agreement, i.e. to limit global warming to a level well below 2°С and to pursue efforts not to exceed 1.5°С above pre-industrial levels, require transition to renewable energy sources (RES) within narrow timeframe, namely over the next few decades. In order to protect ecosystems of the planet and themselves from the catastrophic consequences of the climate change, all nations must eliminate greenhouse gas emissions from their activities and achieve negative carbon balance already in the second half of the 21st century. This means that by 2050, transport, energy, industry and population should all fully switch to renewable energy sources, keeping most of the explored coal deposits, as well as a significant share of oil and gas reserves, in the ground. The fact that a complete transition to RES all over the world is technically and economically feasible has been proven by a number of studies. First detailed models and justification for global energy transition were published in the Energy [R]evolution Scenario report by Greenpeace International in 2007. The fifth edition of Energy [R]evolution Scenario published in 2015 states that the use of renewable energy sources would allow giving a universal access to electric power supply for 100% of the population in all countries of the world by 2030. And by 2050, renewables can totally satisfy global energy needs of the mankind. In the same year 2015, a team of researchers from Stanford University and University of California, led by Professor Mark Jacobson, conducted an assessment of the global potential of RES based on available open data and showed how exactly 139 countries in the world, including Ukraine, can fully satisfy their energy needs by using renewable energy by 2050. The seriousness and acuteness of air pollution, climate change and energy security issues, as well as numerous advantages of the modern decentralized renewable energy technologies, require initiating massive and urgent transformation of energy infrastructure all over the world. Thanks to political messages sent by the Paris Agreement, shifts in this direction have already begun. In Ukraine, special urgency and acuteness of the energy transition issue is due to the threat to energy security. According to the well-known German politician Hans-Josef Fell, the author of the "green tariff" (feed-in tariff) in Germany and one of the originators of Energiewende, renewable energy development and implementation of energy saving measures in Ukraine is the only way to overcome the dependence on the import of traditional energy resources, especially gas and nuclear fuel. While China and other global economic leaders are heading for innovative development and replacement of fossil fuels, it is not only uneconomical, but also dangerous for Ukraine to be on the sidelines of these transformations, since with such a policy the state preserves its energy dependence on Russia. The acute structural problems of the obsolete and inefficient energy sector, geopolitical conditions and a course for European integration require that energy efficiency and transition to renewable energy sources became a priority of the public policy. A comprehensive macroeconomic study comparing different scenarios of Ukrainian energy complex development, taking into account all energy needs of transport, industry, agriculture and other sectors, was conducted by the experts from the Public Institution "The Institute for Economics and Forecasting of the National Academy of Sciences of Ukraine" with the support of the Heinrich Böll Foundation in Ukraine in 2016-2017. The results of economic modelling performed by domestic scientists are presented in the report "Transition of Ukraine to the Renewable Energy by 2050" and prove that Ukraine has every chance to make energy transition within a given period of time and become part of the sustainable post-industrial development. The team of researchers from The Institute for Economics and Forecasting of the National Academy of Sciences of Ukraine led by Oleksandr Diachuk has modelled three potential scenarios of the future of Ukrainian energy sector: Conservative, Liberal and Revolutionary. According to the Revolutionary Scenario (Fig. 1) providing for the existence of consistent government measures to support RES and energy efficiency, by 2050, a share of RES in the total final consumption of energy resources (FCER) may increase to 91% with simultaneous decrease in the primary energy intensity of GDP to 0.07 toe / 1,000 US dollars. The remaining 9% of energy consumption mainly relate to metallurgical and chemical industries, which use fossil fuels not only as energy sources, but also as feedstock. By 2050, the existing energy-intensive enterprises inherited from the Soviet Union will most likely be closed down or reconstructed using new technologies according to new market needs. Unlike the prospects of energy-intensive industry, long-term trends in transportation, households and service sector are more determined: the use of energy-efficient technologies in construction, widespread use of electric cars, electrification of passenger and freight transport (gradual replacement of oil), the use of heat pumps and air conditioners for heating and cooling, growing number of energy-efficient household appliances and electronics. All this will require a significant amount of electricity, and it is therefore expected that the share of electricity in the FCER will significantly increase. 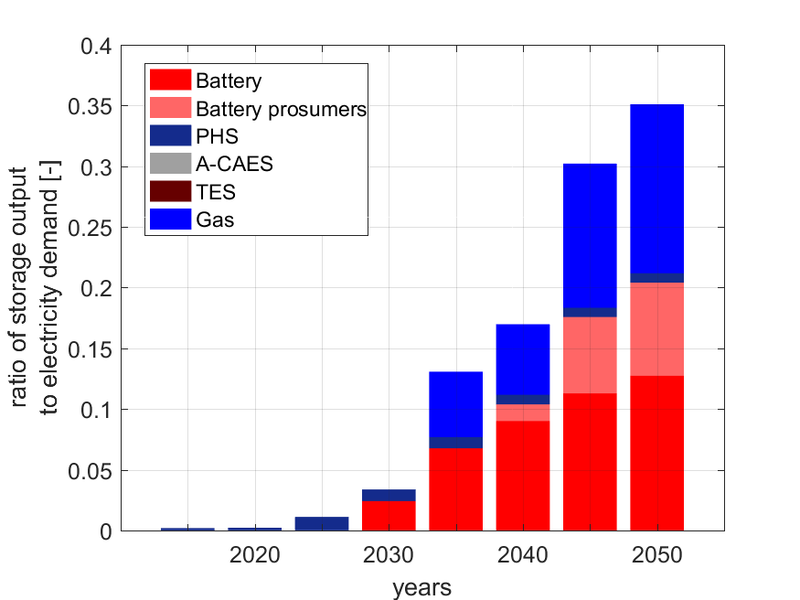 Revolutionary Scenario suggests that the share of electricity in the structure of FCER will increase from 17% in 2012 to 56% in 2050. Modelling shows that the potential of applying the existing RES technologies in Ukraine is sufficient to meet growing demand for electricity while simultaneously replacing outdated, worn out and environmentally hazardous facilities of the traditional power industry. 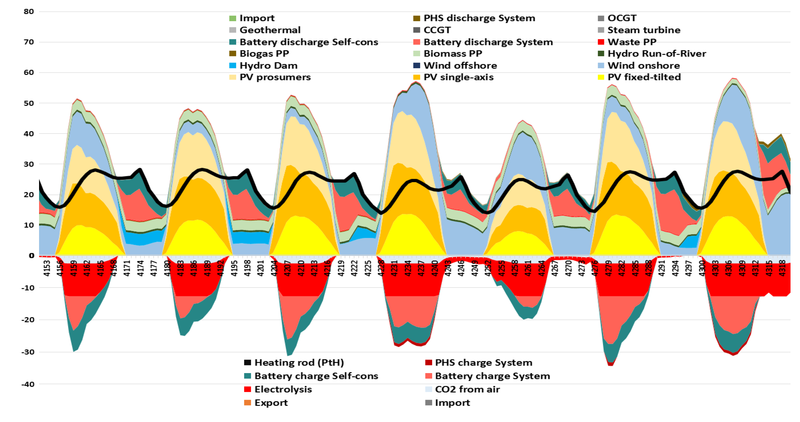 According to another modelling performed by experts from Lappeenranta University of Technology (Finland) in the study "The role of storage technologies for the transition to a 100% renewable energy system in Ukraine", it is technically possible and economically feasible to completely transform Ukrainian energy sector achieving 100% RES in the electricity supply. At the same time, all existing coal power capacities can be gradually replaced and decommissioned by 2035. The scenario for electric-power industry offered by international researchers also involves gradual closure of nuclear power plants: the last reactor should be taken out of service and enter decommissioning process in the second half of the 2040s. By that time, State Enterprise "NNEGC Energoatom" should accumulate sufficient funds to finance decommissioning of NPPs and safe management of radioactive waste. Hourly modelling of the operation of the United Energy System (UES) (Fig. 3) showed that it is possible to achieve stable energy supply in Ukraine throughout the year and in all weather conditions based on a combination of the existing RES technologies, gas turbine stations (at an intermediate stage), and at later stages – by energy storage and conversion technologies, which will play an important role after 2030. According to the scenario they developed (Fig. 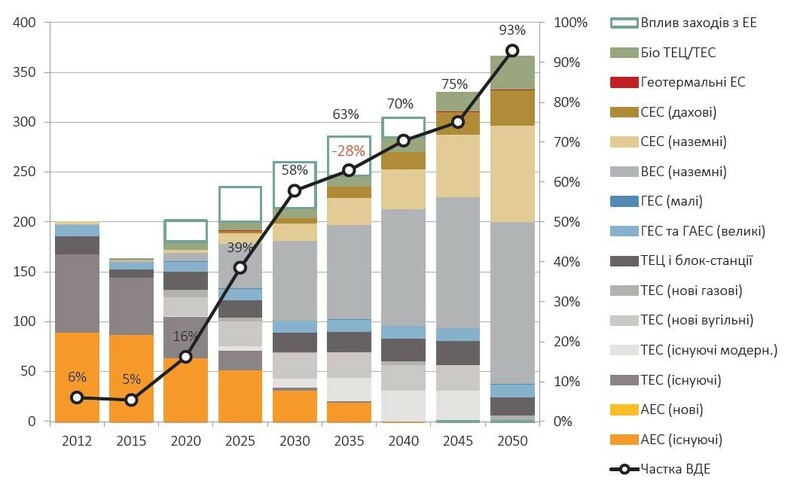 4, diagram on the left) by 2035 90% of the electricity production could be provided by renewable energy sources. The authors emphasized that, considering the long-term trends in technological development and reduction in the cost of equipment for renewable energy and energy storage and conversion, such a restructuring is economically sound. Technological solutions to launch transition to clean renewable energy sources are already widely available in the modern world and continue to advance rapidly, but regulatory and political aspects of introduction of RES and energy efficiency measures are still facing significant challenges and obstacles. Therefore, the goal of switching to renewable energy sources by the middle of the century seems ambitious more from a political point of view rather than from technical and economic perspective. How ambitious are current national goals in the area of RES, energy efficiency and reduction of greenhouse gas (GHG) emissions? Energy Strategy of Ukraine until 2035 (hereinafter referred to as the Strategy), approved by the government in August 2017, does not envisage a rapid increase in the level of energy efficiency of Ukrainian economy, which is now the most energy-wasteful in Europe. Currently production of one unit of GDP in Ukraine consumes 3-4 times more energy than in the EU. According to the Strategy, the level of specific energy intensity of Ukraine's GDP in 2035 will be higher than the current average level of energy intensity among EU countries. In practice, this means remaining technologically backward and wasting a lot of energy. At the same time, this and other official documents state the extremely high wear and tear of Ukraine's heat and electric power infrastructure, insufficient accounting of energy resources, and the urgent need to increase the efficiency of final energy consumption. National Energy Efficiency Action Plan for the Period until 2020 states that necessary financing for energy efficiency and energy saving measures for the period from 2015 to 2020 is estimated at a total of EUR 35 billion or EUR 7 billion a year, which would allow to reduce final energy consumption by 6.5 million toe or 9% relative to the average level for 2005-2009, and significantly improve the state of the infrastructure and buildings of housing stock. In reality, state support for energy efficiency in 2017 was only UAH 800 million (EUR 0.026 billion) and remains at the same level in the draft budget for 2018. Obviously, with such level of state support, it is unlikely to achieve stated energy saving goal by 2020. In a 2035 perspective, new energy strategy does not set a specific energy saving goal, which is justified by the uncertainty of forecasting final energy consumption in Ukraine under conditions of external aggression and loss of the part of its territory. In particular, due to the occupation of the Donbas, the annexation of the Crimea and economic decline, the volume of FCER in Ukraine in 2015 fell to 47.5 million toe compared with 67 million toe in 2012. According to the forecasts used as a basis for the Energy Strategy, which presume restoration of territorial integrity of Ukraine, total supply of energy resources in 2035 will grow by 6.5% relative to the level of 2010-2012. Since there are no significant changes in the projected energy supply structure, Ukraine will remain dependent on fossil fuels (coal, oil and gas), with significant part of which will have to be imported. The goal for 2035 set under the Strategy for the RES sector is only 25% of the final energy consumption. 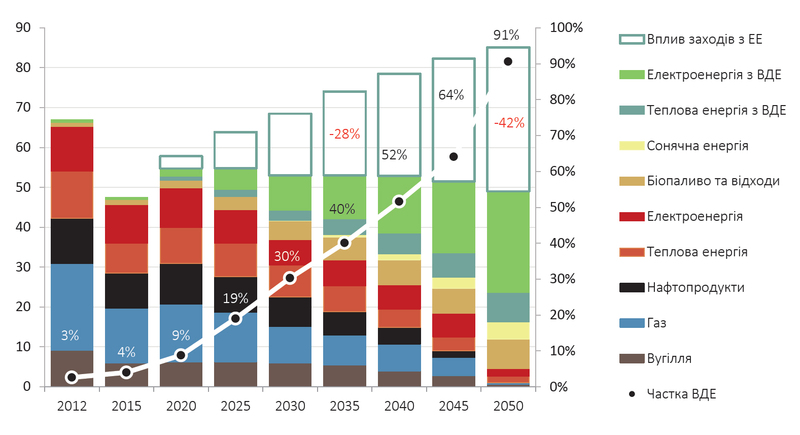 At the same time, according to the Revolutionary Scenario, in 2035 it is possible to achieve an increase in the share of renewable sources in the FCER up to 40% with simultaneous reduction of the overall consumption by 28% through energy saving and energy efficiency measures (see Fig. 1). 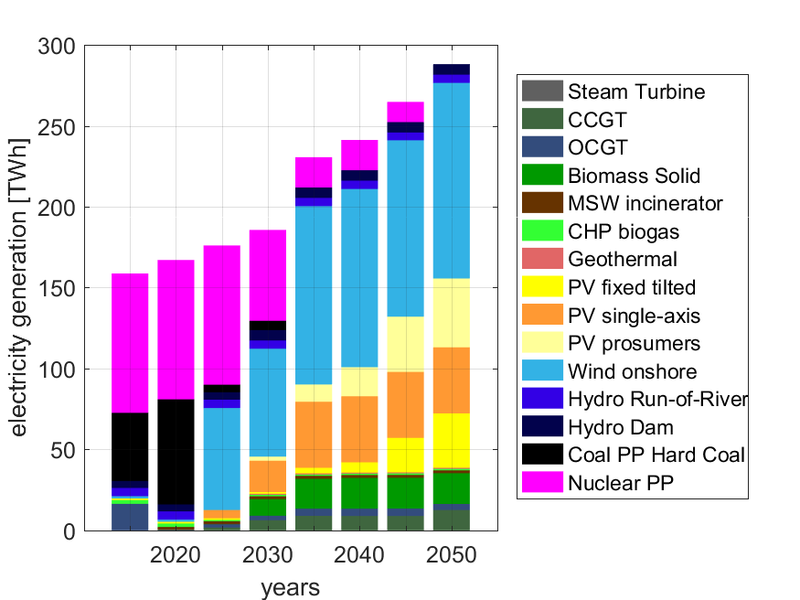 The Strategy sets targeted increase in the share of RES in the structure of electricity production by 2035 at a similar level of 25%, compared to technically achievable 90% (M.Child, D.Bogdanov and C.Breyer, see Fig. 4) and economically feasible 63% (O. Diachuk and others, see Fig.2). An even bigger problem is that the Energy Strategy takes up an erroneous position of the lack of ambitious goals for reduction in greenhouse gas (GHG) emissions, which was initially declared in the Intended Nationally Determined Contribution (INDC) concerning emissions reduction target submitted by Ukraine to the Secretariat of the United Nations Framework Convention on Climate Change in 2015. As a contribution to international efforts to counter catastrophic changes in climate, Ukraine then proposed an inadequate target: according to that INDC, in 2030, greenhouse gas emissions in Ukraine may constitute up to 60% of the 1990 level, while in 2012 they constituted only 42.6%, actually allowing carbon pollution to grow significantly. At the same time, calculations of experts from The Institute for Economics and Forecasting of the National Academy of Sciences of Ukraine show that even in the absence of any progress in implementing RES and energy efficiency measures and increasing energy consumption proportionally to the GDP growth (Conservative Scenario), greenhouse gas emissions in 2030 will not exceed 56% of the 1990 level. It is no coincidence that in the annual ranking of international agency Climate Action Tracker (CAT) Ukraine received the lowest ranking of the national climate policy goals declared by the states under the Paris Agreement. Modelling under the Revolutionary Scenario shows that due to technological upgrading, energy efficiency measures, and switching to RES, GHG emissions in Ukraine in 2030 can be reduced to 28% of the 1990 level and to 10% in 2050. This proves the need to revise the INDC and submit ambitious and structured goals under the Paris Agreement in 2018, which will allow attracting innovative companies and investments in "green" modernization of economy. What should be the policy of energy transformation? Taking into account the intentions of Ukraine to be integrated into the European Union, the global climate crisis, the necessity to replace environmentally hazardous and obsolete energy infrastructure, inherited from the Soviet Union along with the dependence on energy supplies from Russia, a constructive energy policy in Ukraine should promote development and rapid introduction of renewable energy sources, improvement of energy efficiency, reduction of the specific energy consumption and dependence on fossil fuels. If country wants to move towards building a modern post-industrial economy, then energy efficiency, renewable energy sources, knowledge-intensive clean production and innovation should become real priorities, that are consistently supported and introduced at all policy levels, from local governance to the highest executive authorities. Individual officials recognize the need for such a course for Ukraine, but there is still no clear position of the government as whole and individual political factions on climate and energy issues. So far, only some positive developments have taken place in this direction. In particular, during his speech in June 2017 at the Forum "Clean Energy for a Sustainable Future" in Vienna, Minister of Ecology and Natural Resources of Ukraine Ostap Semerak stated that Ukraine is ready to be an active participant in the international fight against climate change and is aware of the importance of the transition of the national economy to the "green" development model based on renewable energy sources and improved energy efficiency. At the same time, there are no such developments on the part of the Ministry of Energy and Coal Industry, and its head keeps away not only from the issues of RES development and support of energy efficiency measures, but also from urgent sectoral tasks. In particular, ways of restructuring coal mining and power generation in a socially responsible manner remain undefined. Furthermore, operators of coal power plants, average age of which exceeds 45 years, have no incentives and financial instruments for modernization and reduction of toxic emissions of ash, sulphur and nitrogen oxides, levels of which are highest in Europe and cause grave damage to the health of population. The major obstacles are the uncertainty of ways how to attract funding for installation of pollution control equipment at those thermal power plants, which would continue to be operated after Ukraine's energy system is synchronized with pan-European network ENTSO-E, as well as the lack of a long-term vision of the economic prospects of such enterprises and dependent communities. Implementation of the National Emission Reduction Plan (NERP) of major pollutants from the large combustion plants with thermal input exceeding 50 MW, which is one of the key commitments under the Energy Community Treaty, in mid-term would allow to reduce the levels of toxic air pollution in Ukraine and would provide long-term vision and certainty regarding timeframe for phase-out of coal-fired power generation in Ukraine. The same applies for regulation of emissions from medium-sized (less than 50 MW) combustion plants, which is already coming into effect in the EU and may also become mandatory for Energy Community contracting parties in the future. It should be noted that, along with commitments to deliver energy reforms under the EU-Ukraine Association Agreement, Ukraine's participation in the Energy Community, despite significant delays and obstacles, remains a major driving force for the implementation of a consistent energy policy aimed at sustainable development. As the experience of the EU shows, the integration of climate and energy policies is the first necessary step in moving towards Energy Transition. There is also a growing understanding that implementation of the long-term programme "Clean Energy for All Europeans" presented by the European Commission in November 2016 will be incomplete without Ukraine. In practice, climate and energy policy integration requires clear and ambitious mid-term and long-term targets set by the government, increased cooperation between ministries, harmonization of different strategies, sectoral plans, programmes and respective roadmaps for their implementation. Each sectoral document should include measures to improve energy efficiency and provide energy saving, as their implementation can give a quick and significant economic effect, while reducing greenhouse gas emissions. Research by Ukrainian scientists indicates that the target of the National Action Plan for Renewable Energy for the period until 2020, set at the level of 11% of RES in the final energy consumption, most likely will not be achieved and is projected at the level of 9% in 2020 (see Fig. 1). Nevertheless, Ukraine can quickly catch up if the state authorities create necessary conditions. In particular, according to the Revolutionary Scenario, by 2025, the share of RES could more than double and amount to 19% of the FCER. The initial stage of introducing RES, which Ukraine is currently going through, requires a stable regulatory field and balanced, consistent state support. Creation of these conditions will help to attract significant outward investments and to develop own manufacturing of RES equipment and components. Considering special role of the electric power industry, important prerequisites also include the introduction of electricity market, ensuring competitive conditions on the market, strong antimonopoly policy, professional competence and independence of the regulator (National Commission for State Regulation of Energy and Public Utilities). Members of Parliament should demonstrate political will to implement reforms, consistently improve legislative framework implementing legal norms and obligations specified in the Association Agreement and the Treaty establishing Energy Community, as well as to exercise due control over the activities of the executive authorities and regulatory bodies. The decisive factor for success is a political will to modernize the state, improve welfare of the population, and create new highly skilled jobs. Transformation of the global economy, which has already begun in response to the need to counteract and adapt to climate change, gives a major opportunities for Ukraine. Source: M.Child, D.Bogdanov and C.Breyer "The role of storage technologies for the transition to a 100% renewable energy system in Ukraine"